This weekend saw the Honda-RedMoto World Enduro Team compete in the eighth edition of the Karkkilian, the enduro sprint competition contested in the Finnish town of Karkkila (80kms northwest of Helsinki). It was an amazing result for Davide Soreca who won the E1 class and finished fourth in the overall classification, which was ruled by the Finnish riders who benefitted from the home advantage. Giacomo Redondi finished third in both the E2 class and in the overall classification, losing time due to two falls in the snow and ice – without this delay Redondi would have been fighting for the victory. 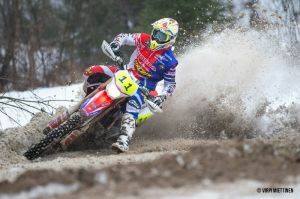 The Honda-RedMoto World Enduro Team riders faced the competition with grit and determination, racing with winter tyres in accordance with the Finnish Road Code. The incredible performance bodes well for the opening round of the Enduro World Championship, which will also be contested on the snow and ice of Finland (25-26 March).